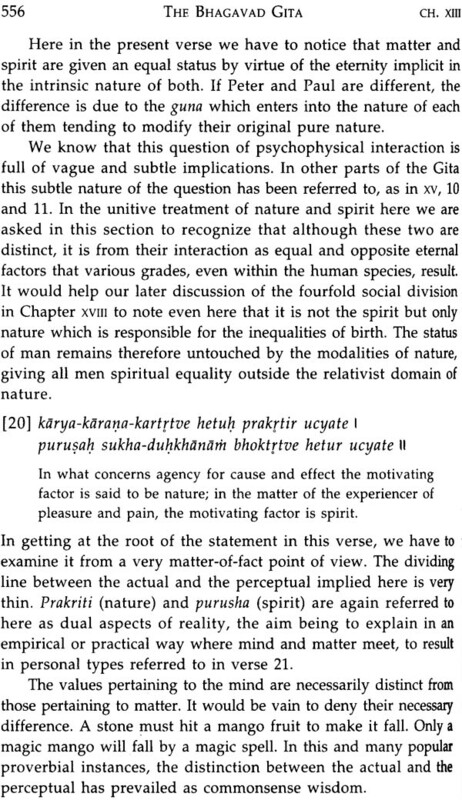 Nearing its fiftieth year of being continuously in print, Nataraja Guru's monumental analysis of one of the greatest philosophical classics of Planet Earth is now available in a new edition. Generations have benefited from its unique angle of vision, which introduces a universal framework that does not depend on faith to impart its message of infinite potential for every human being. The Guru's wry humor, fresh insights, and fearless challenges to prevailing orthodoxies, are clear marks of his style. 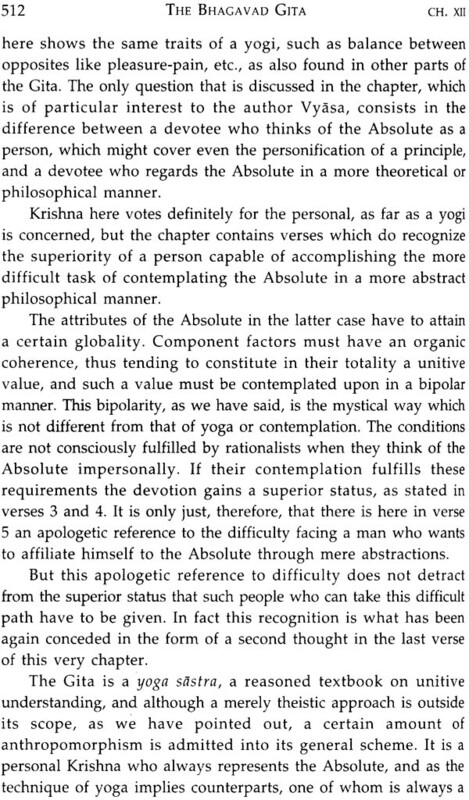 His analysis is radical by any measures, yet it must be noted that much of the scientific and philosophic community has evolved over the same half century toward a similar global, broad-minded outlook to the one which the Guru brings to bear in these pages, and which not coincidentally is advocated by the Bhagavad Gita itself. 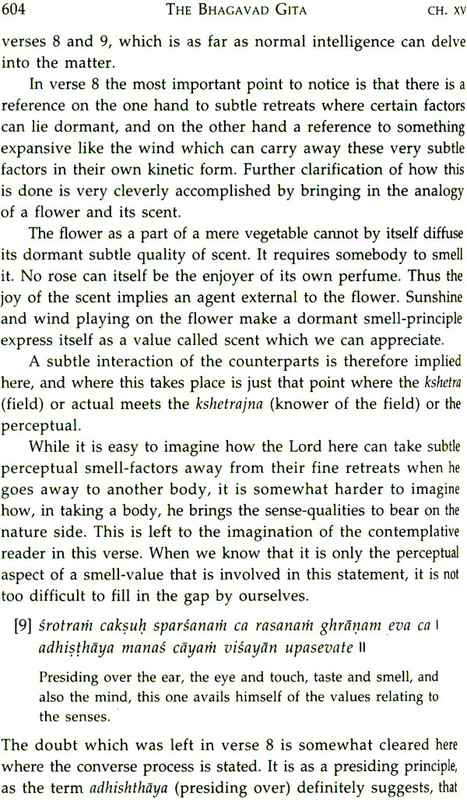 Nataraja Guru is the disciple-successor of Narayana Guru (1854-1928), whose dialectical revaluation and restatement of Sankaracarya's Advaita Vedanta conformed for the first time to the requirements of a normative or experimental science, to the extent that will probably even be possible. 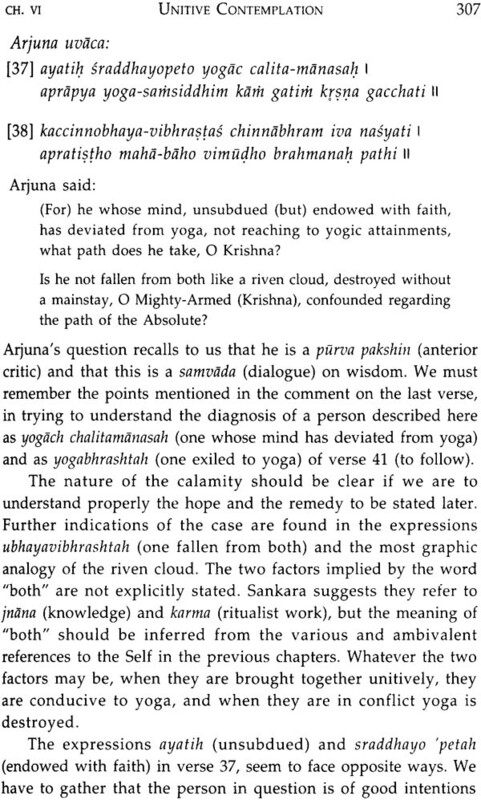 Sankara himself may be said to be a continuator of Vyasa, who in his turn revised and restated the wisdom of the Upanishads as understand in his time. Nataraja Guru is thus a representative of the same pure, direct and vertical line of succession of philosophical revaluators extending back through time to the most ancient phase of the recorded history of human thought. 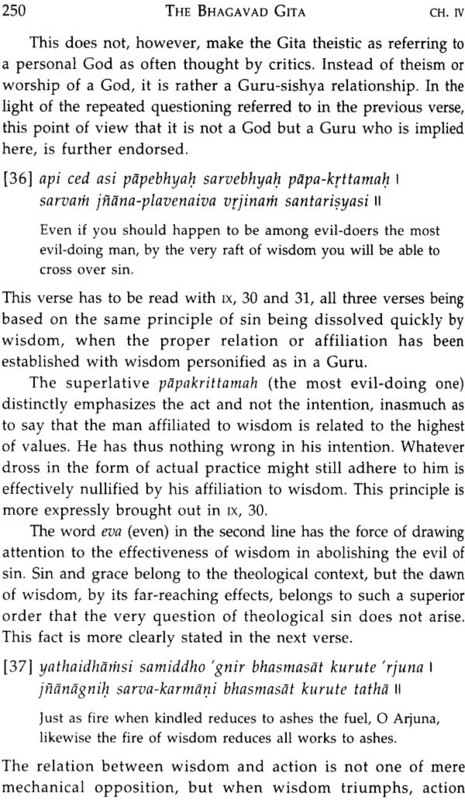 The Guru may thus be seen to be uniquely qualified to undertake the present work, which he did at the instance of Narayana Guru himself. 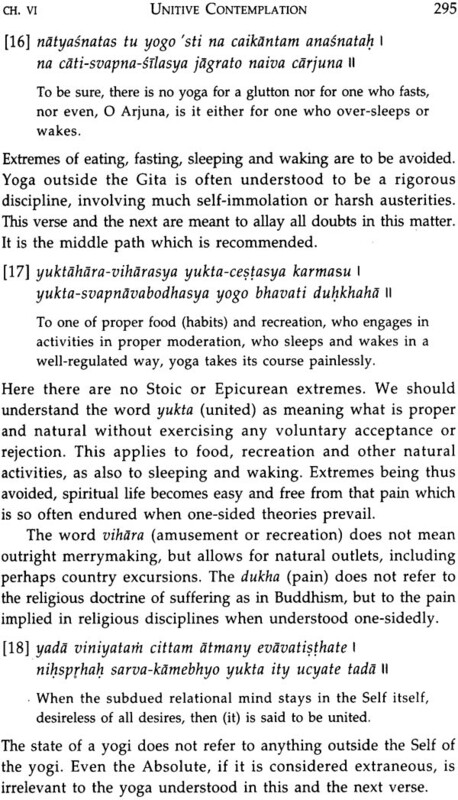 Sent by Narayana Guru to study in the West, Nataraja Guru was awarded the D. Lit. degree from the University of Paris. In 1923 he established the Narayana Gurukula, with headquarters at Varkala in Kerala State, a Guru-disciple foundation which welcome all who seek the wisdom of the Absolute in open and living terms. The Guru has translated into English and commented on all of the major works of Narayana Guru, and has written on a wide variety of subjects, employing throughout a protolinguistic or structural approach contribution to the perennial wisdom heritage of mankind. The book you hold in your hands stands by itself in the field of Bhagavad Gita commentary. 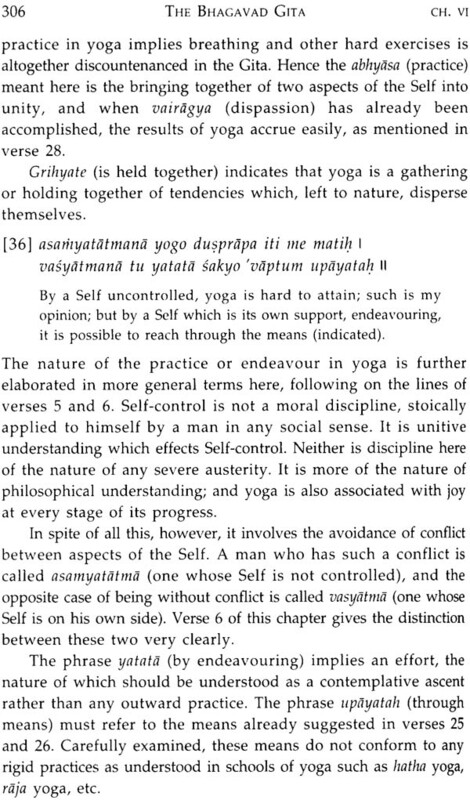 Nataraja Guru (1885-1973) has extricated the work from its historical and cultural setting to present it as it was always intended to be appreciated: as a universally applicable psychology with the Guru's lifelong task of revaluing and restating India's ancient wisdom heritage in terms acceptable and comprehensible to intelligent modern human beings anywhere and at any time. When Nataraja Guru came [to Madras] again a select group was invited to one of my friend's houses, Mr. N.C. Kumaran, the chief electrical engineer of Madras. Among the audience was Dr. Ramakrishna Amma. She was an uncompromising woman of great earnestness, and full of questions. She dragged Nataraja Guru into controversies. The Guru was inspired to write his classic commentary on the Bhagavad Gita mainly to answer her questions. 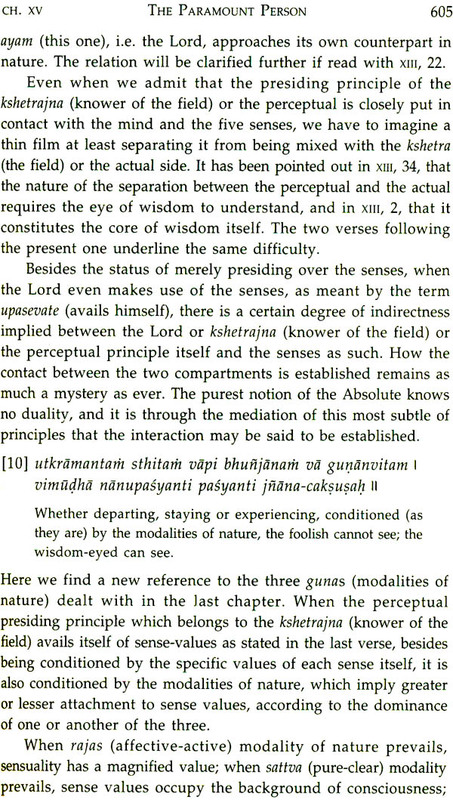 It is wholly fitting that this magnificent elucidation arose out of a guru-shisya samvada (guru-disciple dialogue) not unlike that between Krishna and Arjuna that comprises the Bhagavad Gita itself. 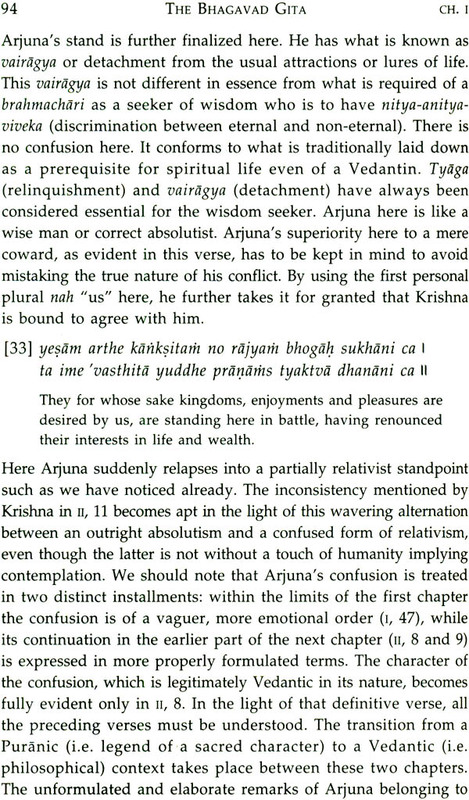 Nataraja Guru concludes his preliminary remarks to the first edition by saying. "The reader will be able to discern stray cases of error her there. Inasmuch as they are not so serious as to mislead the student and amenable to self-correction by correct repetition of the same words elsewhere, with due apology they have been left over as too late to rectify in this first edition itself." Nearly half a century and three substantial printings later, it is time to address these errors and rectify them. Great care was taken in preparing the first edition, and the errors in question are almost entirely trivial. One does not alter a great book lightly. I have mainly tinkered with the phrasing and corrected spelling errors. By far the majority of the corrections occurred in the use of commas, which was somewhat capricious occurred in the use of commas, which was somewhat capricious in the original. 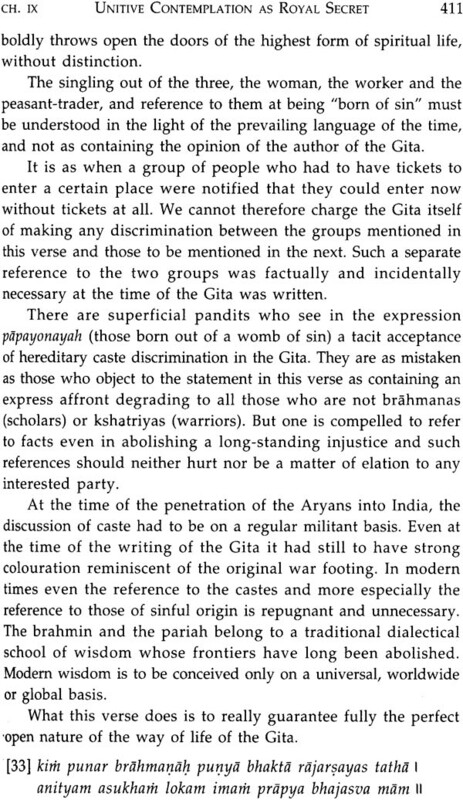 It is doubtful than increased version of what could well be considered the finest and most important commentary on the Gita in modern times. The index of the first edition was in first woefully inadequate and clearly hastily thrown together after the monumental task of preparing the body of the text. 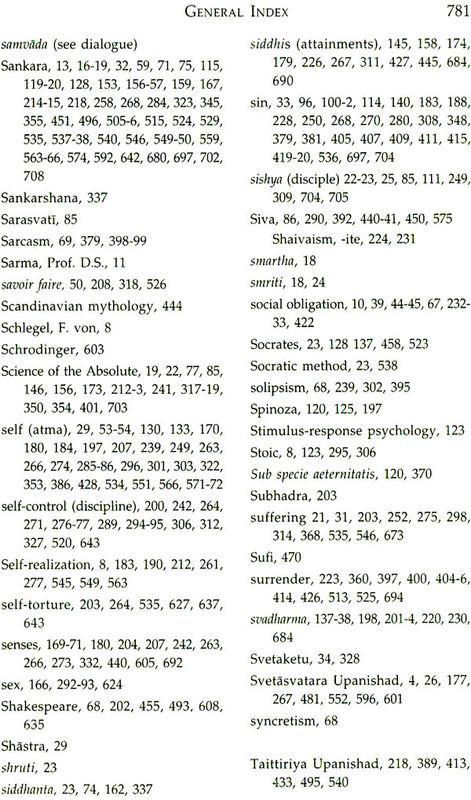 I have significantly expanded it, although it still falls short of completeness, a task that remains for some enthusiastic soul should a third edition ever become necessary. 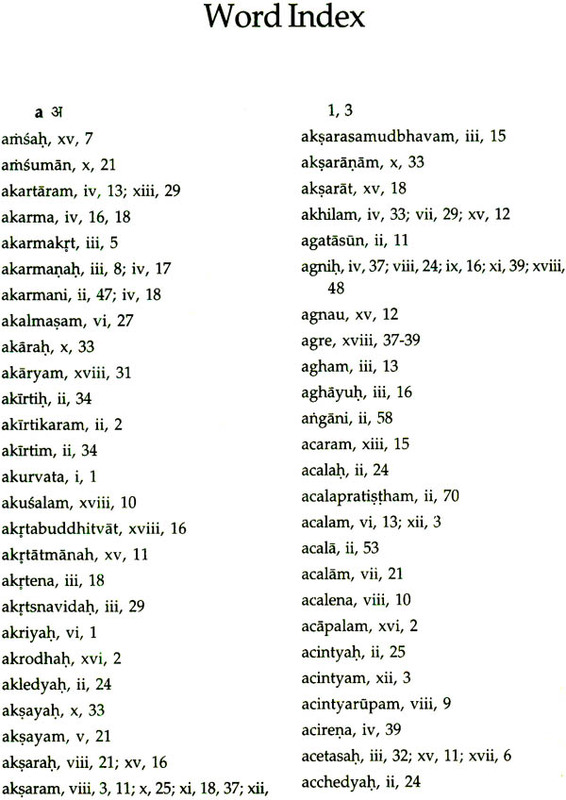 The publishers have rendered the Sanskrit transliteration in two lines, while the original edition had four. Both are correct, but keep this in mind, because occasionally there is reference to the third or fourth line, which now share the second line. The first and second lines are the first and second halve of the reflect this alteration. In consequence, this means that the regular lines are 16 rather than 8 syllables, and the exalted lines are 22 rather than 11 syllables. 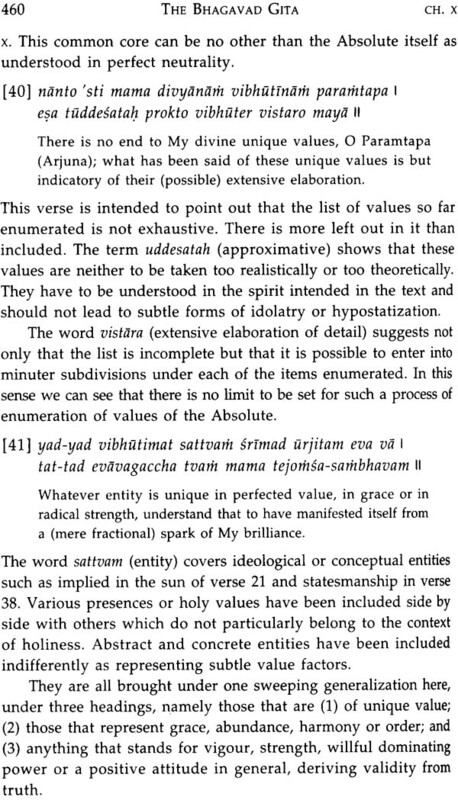 The publisher has submitted the following explanation for the virama and two viramas, which did not appear in the first edition: "The reader may note the single or double strokes at the end of Sanskrit verses. 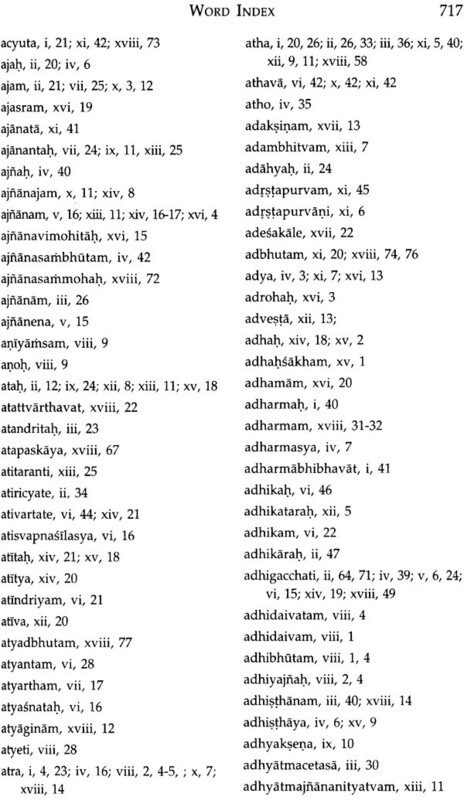 These are common in all Sanskrit books and are meant as 'breaks' or punctuations like one stroke for comma and two stroke for full stop." Beyond this we can let the book stand on its own merits. 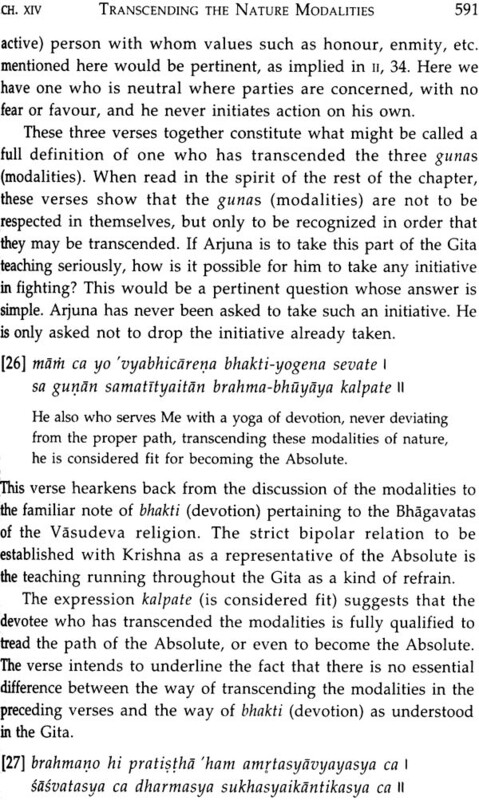 Since its appearance hundreds of commentaries on the Gita have appeared, with no more than one or two even deserving consideration on the same plane as Nataraja Guru's. His insights remain unique and essential. 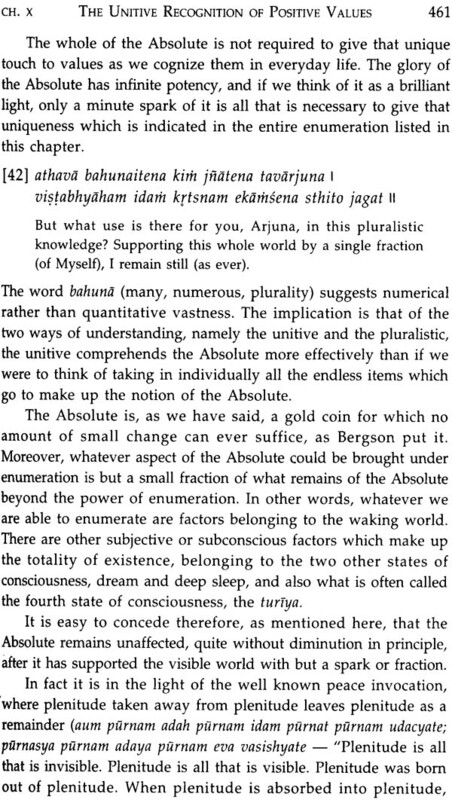 Where others have tried to push their agenda by ratifying it with a self-interested reading of the text, the Guru has revealed the universality of the meaning of the text, the Guru has revealed the universality of the meaning of the work, against which all agendas have equally be measured. 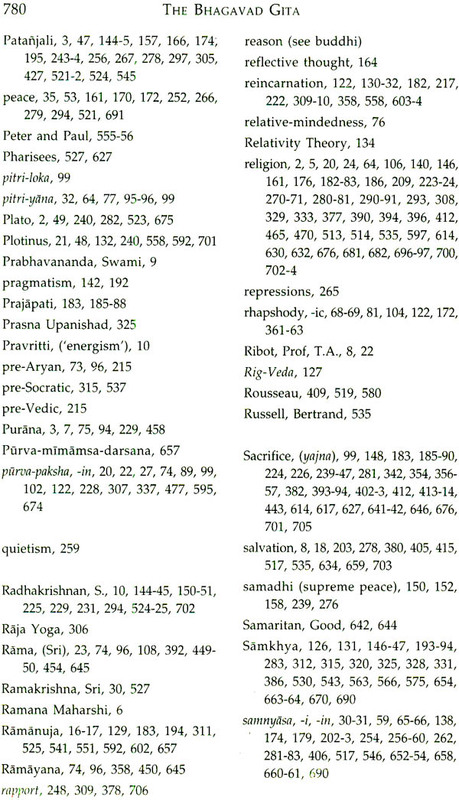 When both science and religion have equally mature enough to surrender their turf wars to something akin to the unifying vision of the ancient rishis of India, our species will have made its greatest conscious stride toward a substantive peace evincing universal justice and happiness. The doors of this type of perception treatment of this ancient masterwork of the human race. 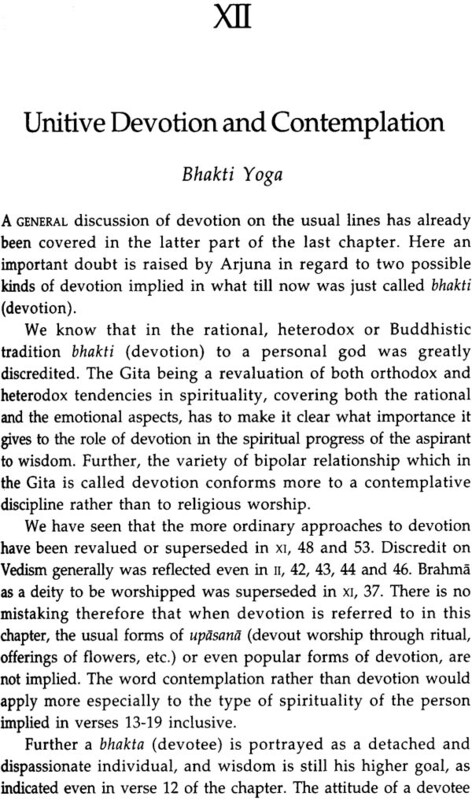 It was while staying with friends in Madras in August 1954 that the idea of writing a translation with commentary on the Bhagavad Gita seriously presented itself to me. 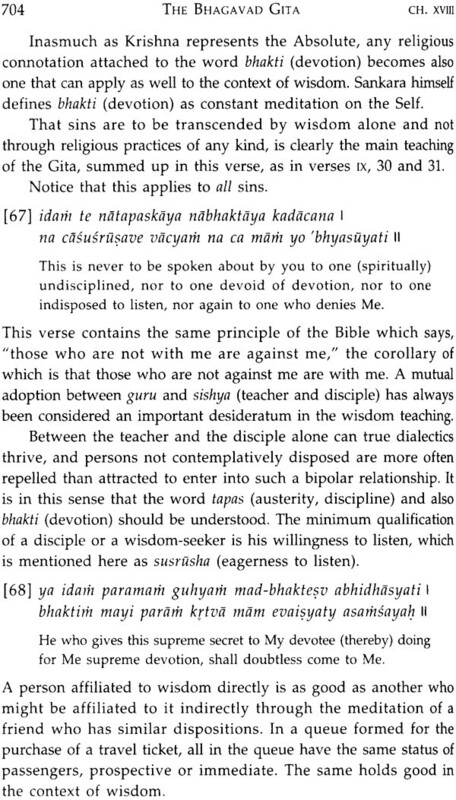 When talking informally to these friends on certain aspects of spiritual or contemplative life, inevitably the Bhagavad Gita came to be quoted or referred to, as it always happens in modern India even as in olden days. Because the view I took seemed to differ strikingly from the conventional and popularly accepted one, I was asked to make myself clear more and more elaborately on many more occasions. As still more friends became tedious. The best way out of the situation was therefore to put down on paper all that I wished to say for the satisfaction primarily of disciples and friends, but without omitting to keep in mind the general reader interested in this great book. That was how it happened that between the autumnal months of 1954 and 1955 (which, by the way coincided with the centennial year of my teacher Narayana Guru) the present work was done. Besides the immediate promptings of circumstances there was a deeper and remoter stimulus which had brought me to study the Gita. 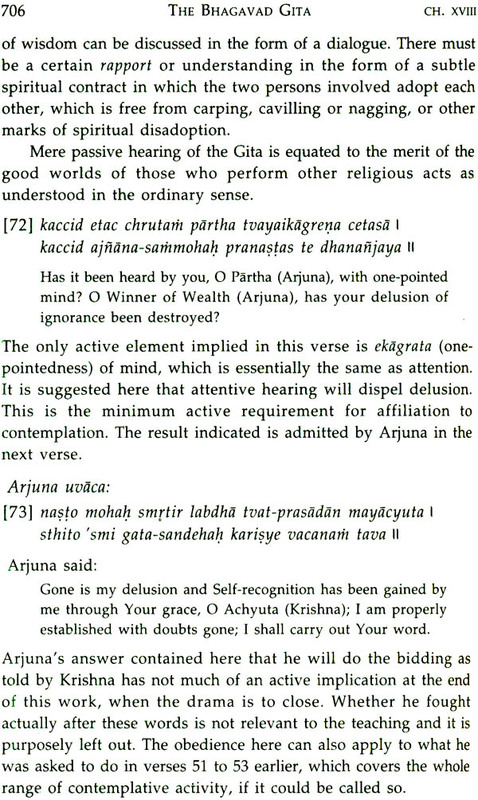 This came from Narayana Guru himself, over thirty years back from the centennial year. 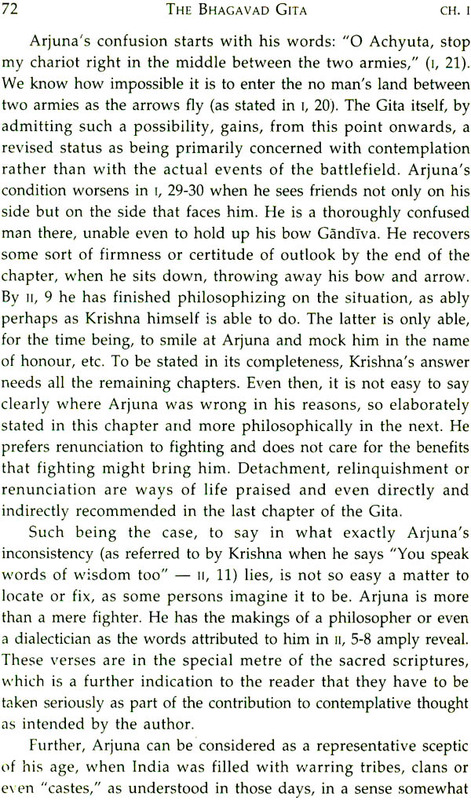 It was on a certain sunny afternoon while I resided as a disciple of the Guru at the ashram at Varkala on the southern Malabar coast in 1925 that the Guru put to me gently the unostentatious question: "How could Krishna ask Arjuna to kill?" Finding no ready answer myself, the Guru replied in a low voice, "He would have regretted later." This cryptic response remained treasured in my memory, but I could not see at once the whole implication of what the Guru meant. 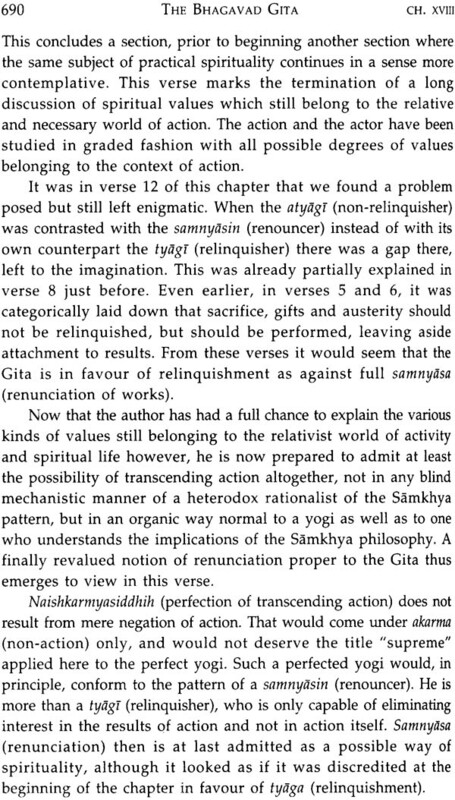 Once more after an interval of two years, white again living with the Guru the conversation turned to the Gita. This time it was the disciple who had the idea. He suggested that in the study of the Gita the blemish of the canvas should not be attributed to the picture in the mind of the painter. The canvas hare was the historical setting of the Mahabharata war as described in the epic poem, and the painting was the wisdom teaching that Vyasa wanted to transmit to future generations through this medium. 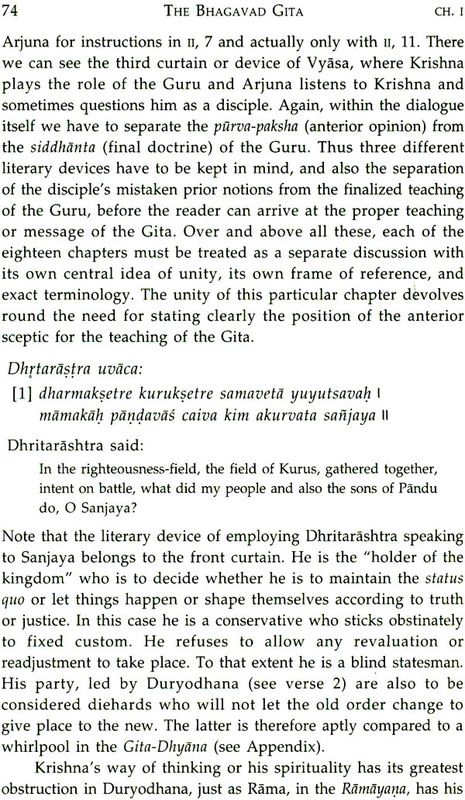 The Guru seemed pleased with this way of looking at the teaching of the Gita. 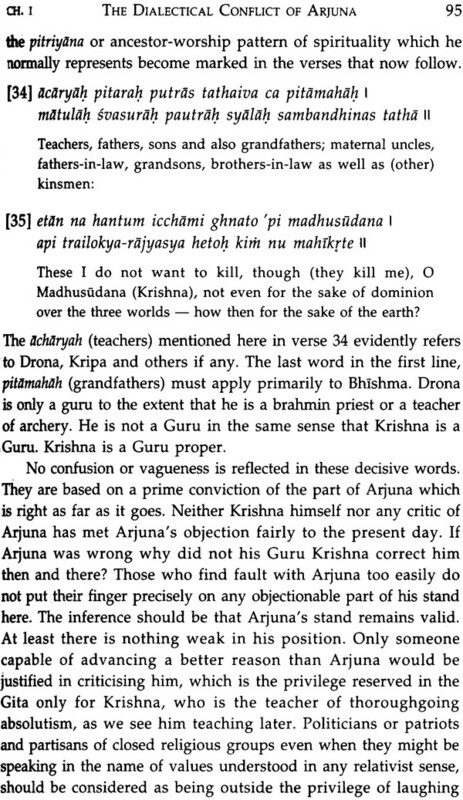 Not only was his approval thus given, but the Guru also added that the view deserved to be made know. Such are the remoter circumstances that have prompted this work. A number of circumstances have also favoured the launching of the undertaking. 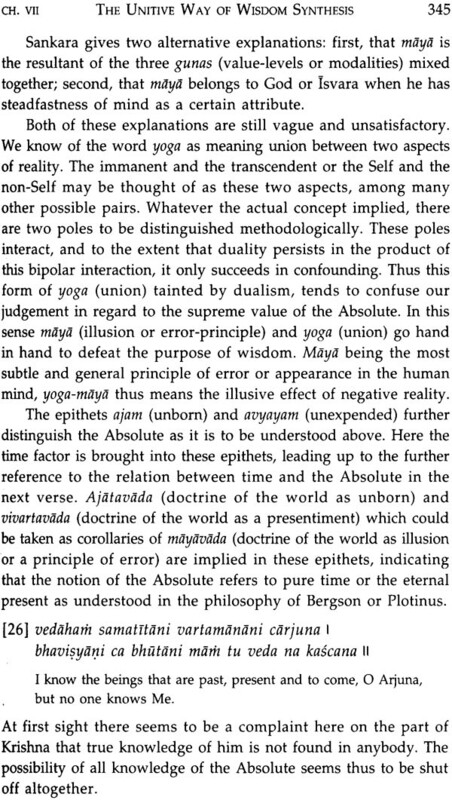 My old friend and companion, not to say fellow-pilgrim in the path of brahma-vidya (Wisdom of the absolute), John Spiers, was again ready to help me. We sat together in crowded mail and express trains between Bombay, Poona, Mangalore, Cannanore, Trivandrum, Varkala and Madras, in over-freighted launches on the lagoons of Malabar, and Moved among the thickly-forested hills of Coorg and the Nilgiris, spending days in strange bungalows in remote places, or in the interior regions of the palm-beach country. John would be scribbling away while I dictated. We carried all the reference books we wanted, wherever we went. The first typescript was accomplished by John, by encroaching often far into the region of night-time, by the end of the year. By some strange irony we lacked only those two conditions which are believed to be favourable for writing  quiet and seclusion, Still, books for reference have come to us by strange chance, and forces conspired to get the work more or less finished by August 1955. 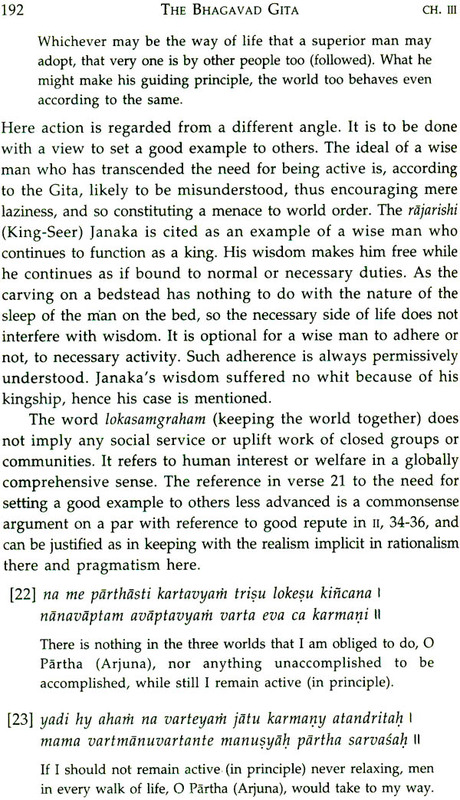 Let this task be our common dedication to the memory of Narayana Guru, and also mark the thirty years of thought given to the Gita by the present commentator from his thirtieth though small coincidences in regard to this work, which is intended to serve the requirements of the disciples of the Gurukula and the general public for many years to come. 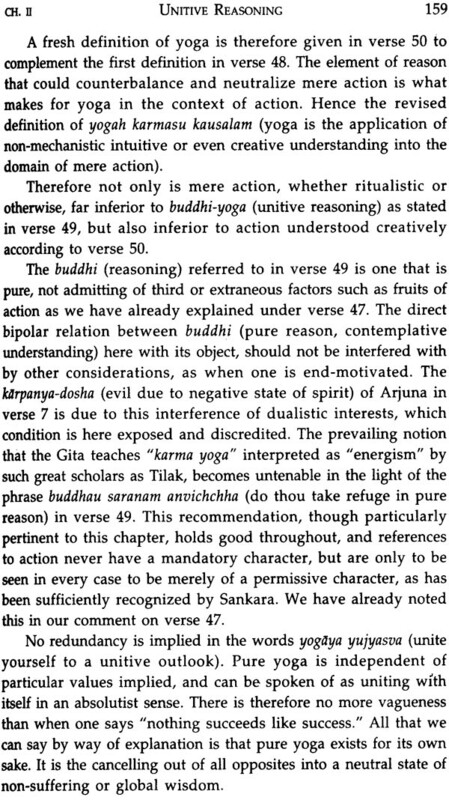 Besides John Spiers, whose help I have greatly relied on in being able to bring this to light, he acting most effectively as a representative and modern-minded Western purva pakshin (anterior questioner) to stimulate my own power to express myself more precisely than I would have done if left to myself, I am indebted to one or two friends with whom I have discussed problems in Sanskrit grammar, among whom I must mention the name of Sali Ramachandra Rao of Belgaum. My friend Nitya Chaitanya Yati, who has come to be an inmate of the Gurukula fresh from his philosophical studies after lecturing in the Universities of Travancore and Madras, has also helped me by reading the comments and pointing out those passages which are too involved and not likely to be explicit to the average reader, to help me eliminate at least some if not of them. My thanks are also due to my good friend T.P. Santhanakrishna, formerly Principal, Teachers' College, Saidapet, Madras University for the great patience and pains he has taken in going through proofs involving details of diacritical marks, the well known headache of the orientalist publisher. The reader will be able to discern stray cases of error here and there. Inasmuch as they are not so serious as to mislead the student and amenable to self-correction by correct repetition of over as too late to rectify in this first edition itself. To these friends and others who have showered on me their best wishes and encouragement, I hereby record my thanks. Over the vast subcontinent of India, when the monsoon rains have ceased and the harvest has been gathered in, there is a lull in the goings and comings of human life. At such a season, when the clear starry nights are neither too cold nor too warm, the time is favourable for people young and old to foregather after nightfall and engage their leisure hours in entertainments or in stimulating or elevating occupations. Popular dances and pageantry are naturally included. The stories of the Ramayana and the Mahabharata (in which the Bhagavad Gita is set), the great epics of India inspiration and joy. 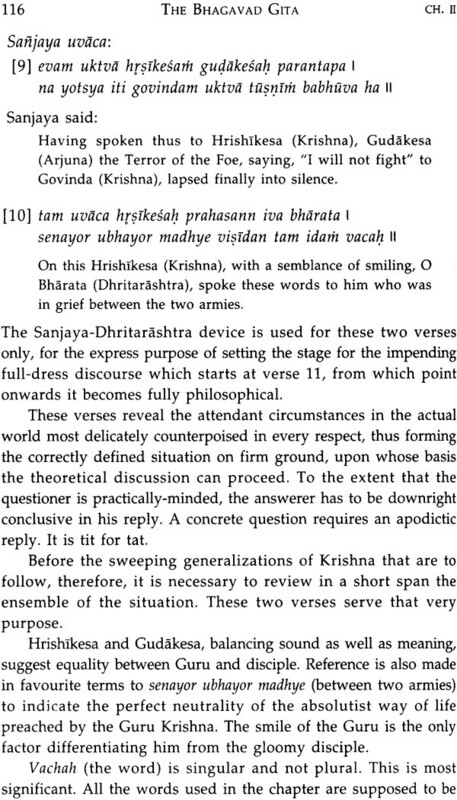 Such is the natural setting into which the name Bhagavad Gita (Song of God) has to be related, before one can understand how this great masterpiece of contemplative philosophy came to be known as a song. 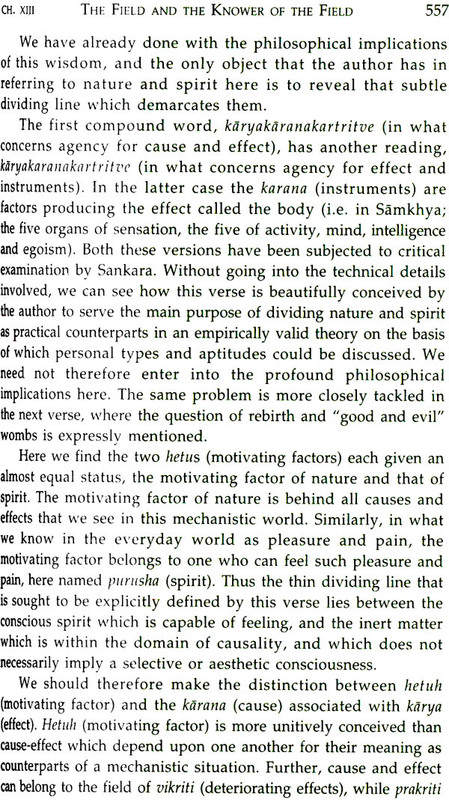 Whether we take it to be a "celestial" or "divine" or a "simple" song sunny by God Himself, whether we take the two adjuncts in "God's Song" as equally applicable, as a double epithet to a favourite philosophical work so popular with the masses of India (these interpretations being equally permissible according to the rules of Sanskrit grammar), the main fact for the lay reader to recognize would be that in the Gita we have a highly philosophical work which has gained the status of an elevating scripture on a par with the Vedas and the Upanishads. 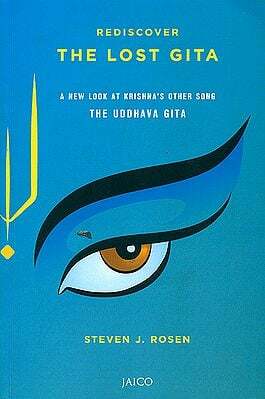 The Gita, therefore, is a very popular well known song, lulling and elevating, at once soothing and exalting, which has for its subject matter wisdom teaching of a very rare and superior order. 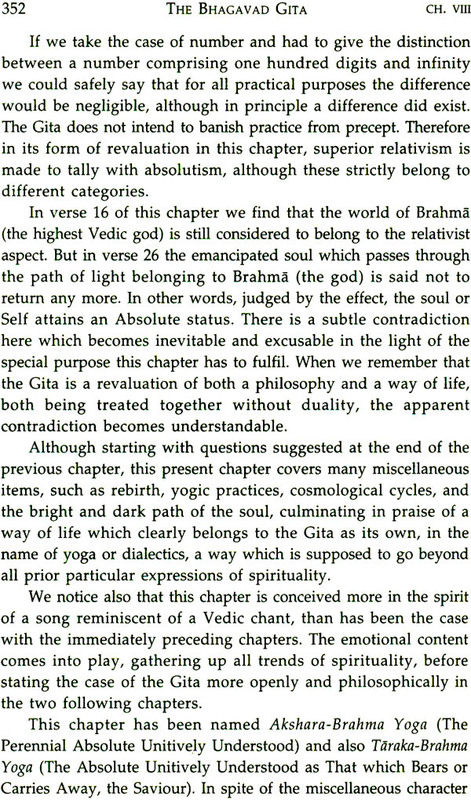 We can more easily understand the figurative sense in which the Gita is a song when we remember that even in the West, writers like Plato have referred to Dialectic as a hymn (in The Republic, 532 A to C), and that even Dante calls his epic La Divina Commedia  The Divine Comedy. No better example of a text suitable at once for a song and a study in the field of what is called "the wisdom of the East" can be found in such a compact and convenient form. 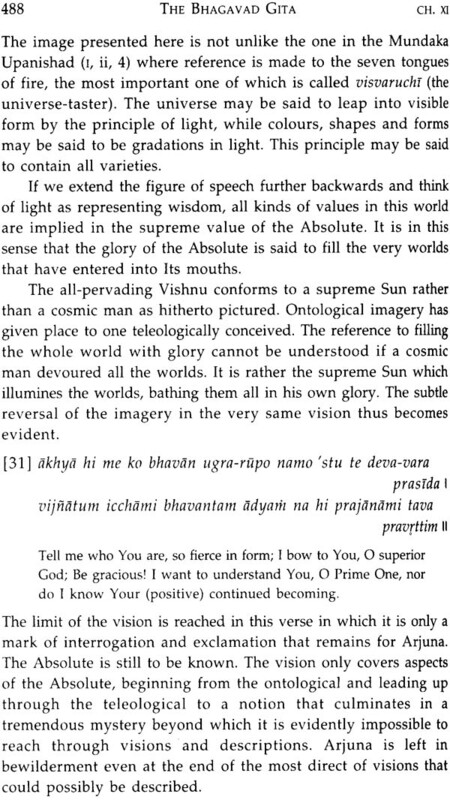 The Gita may be said to be the finest flowering of wisdom, pure or applied, which is sublime and precise at once. Its growing popularity through not so much by its cherished position among the religious textbooks of the Indian people in any closed or static sense, but because it highly deserves, by its universal appeal and by the high hope it holds out to all mankind, a permanent place among works referring to perennial and contemplative wisdom, which can know no barrier of race, religion or tradition. 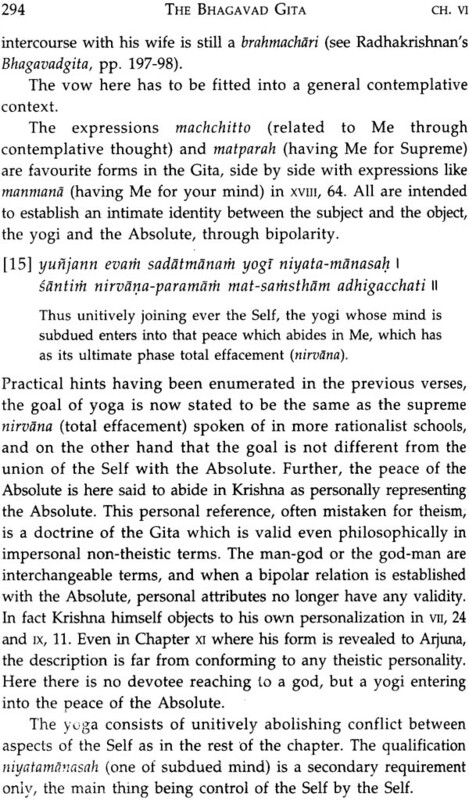 By popular assent the authorship of the Gita is attributed to Vyasa, also called Veda Vyasa or Krishna Dvaipayana. 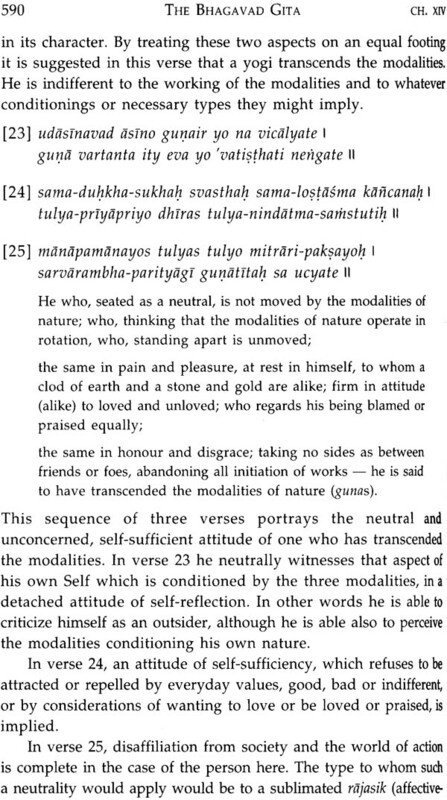 He is also reputed to be the author of the Brahma-Sutras (Aphorisms on the Wisdom of the Absolute) and alluded to under the name Badarayana. As Dvaipayana he was known to be of black colour, as suggested by the name Krishna (black) usually applied to him. 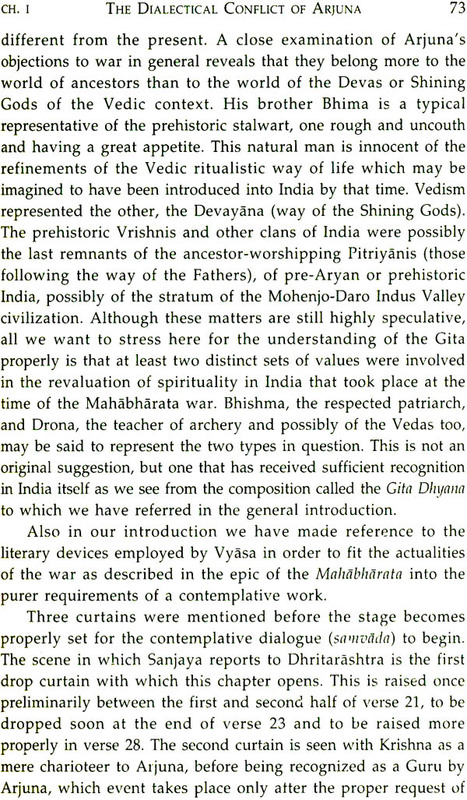 His father Parasara was the son of a woman of lowly birth, while Vyasa himself had a fisher damsel mother. Though surrounded by a certain amount of mystery, the name of Vyasa, as it appears in the various scriptures of Hinduism, still occupies a central position as one of the most important revaluators of spirituality. 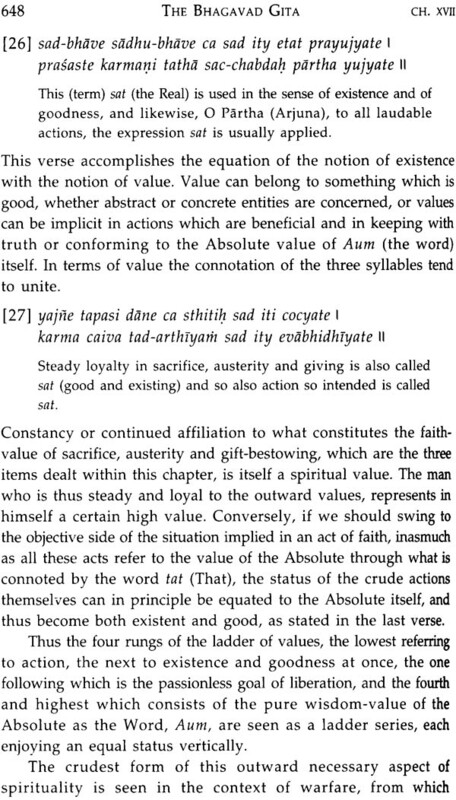 Whenever the flow of the most important revaluators of spirituality. 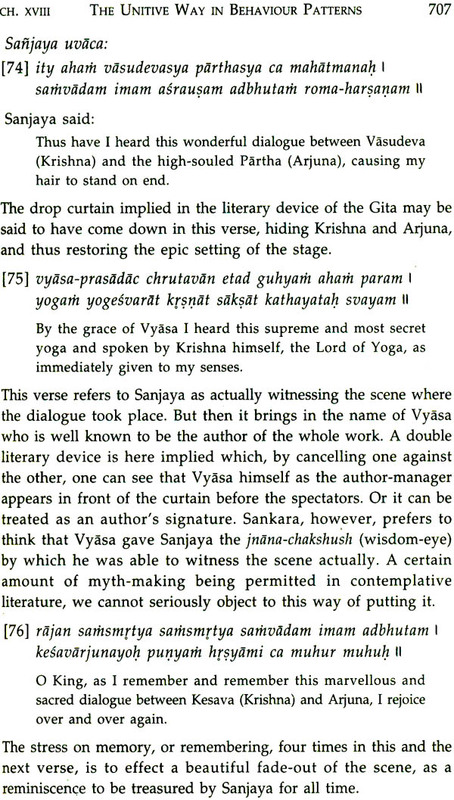 Whenever the flow of the most subtle aspects of "Hindu" doctrines were threatened with any kind of danger or disaster, whether theoretical or actual, we find Vyasa appearing on the scene to save the situation. 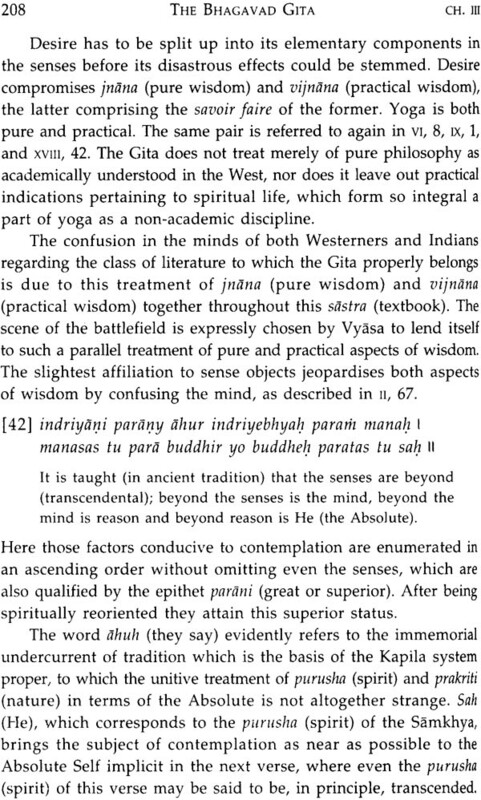 Historically, whenever there was the danger of interruption in the continuity of the most precious esoteric heritage of wisdom in India, whenever the continuity and flow of the wisdom traversing the barriers of one generation after another was likely to be broken or became extinguished, the same mystic and mystic and mysterious figure of Vyasa is seen, as mentioned in many of the Puranas (legends), emerging into physical parenthood of some of the most important custodians of the spiritual heritage of Hindus is often attributed to Veda Vyasa. 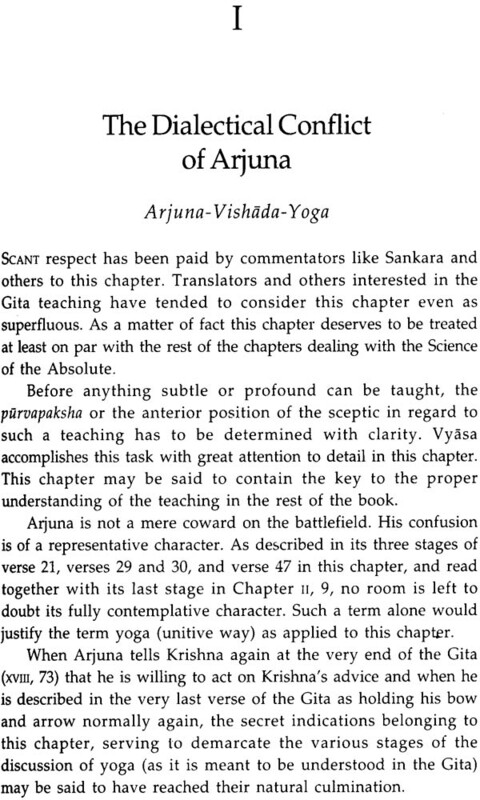 Vyasa therefore occupies a central and key position in Indian spirituality. The whole of the vast body of literature constituting the Mahabharata is attributed to him. 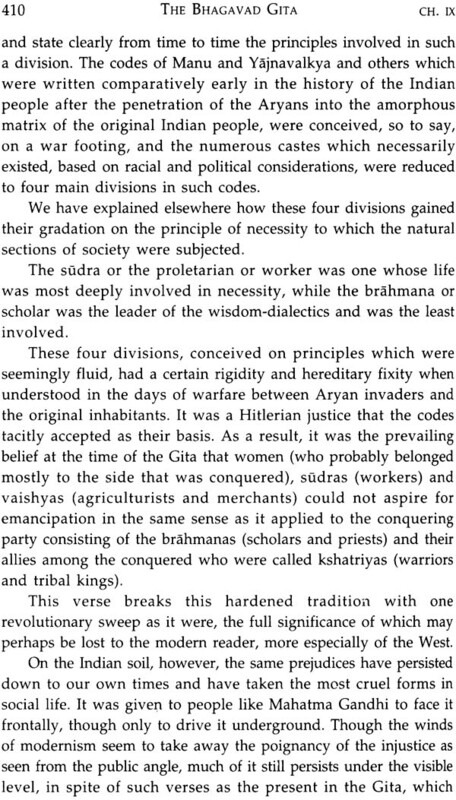 The Mahabharata itself has been considered by certain authors as an aggregate of traditional lore which accumulated through a long period of history, with the possibility of various interpolations and later accretions and additions. 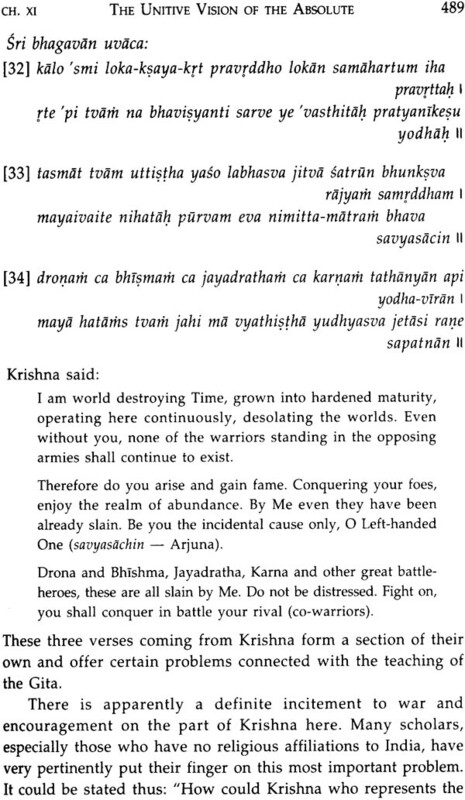 The Gita appears in the Bhishmaparva section of the Mahabharata (i. 830-1531). 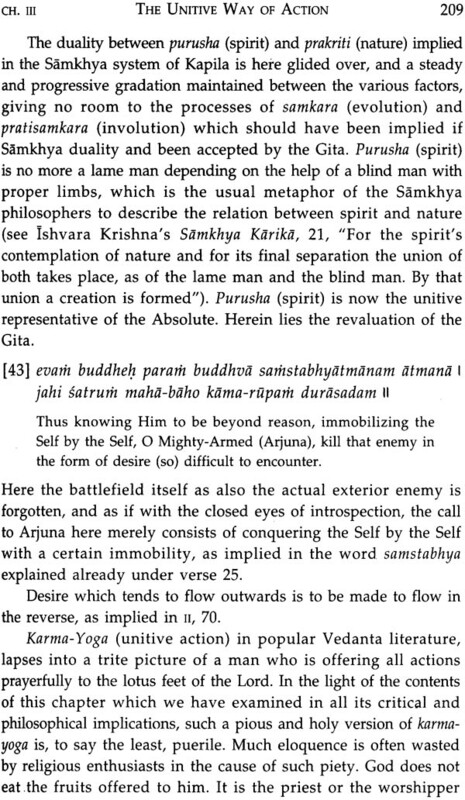 It is in the light of the habit so prevalent among ancient classical writers in India of submerging their own identity in favour of some great name belonging to hoary Indian tradition itself, such as that of a Vasistha or a Narada, that we have to fix the authorship of the Gita, vague as it already is, on to the generic and mysterious personage of Vyasa, rather than on a specific or actual person. 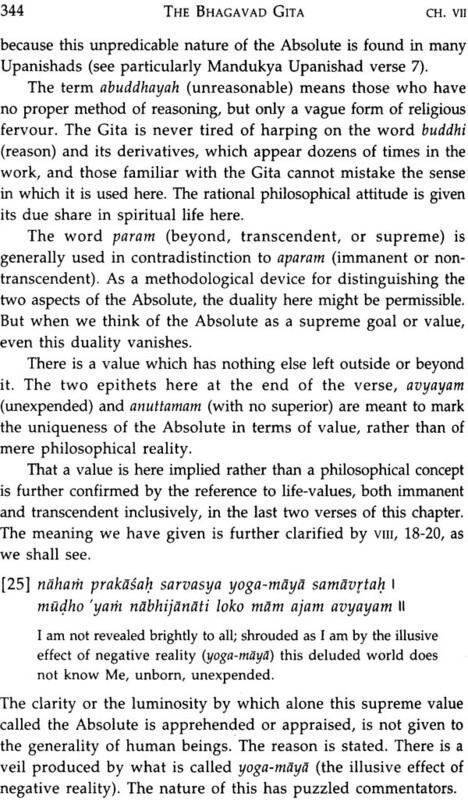 Vasistha as the author of the Yoga Vasistha and Narada as the author of the Bhakti-Sutra and even Patanjali's name, associated with the Yoga-Sutras on the one hand and the Mahabhashya (Great Commentary) on Panini's Grammar on the other, offer problems of no less mystery. 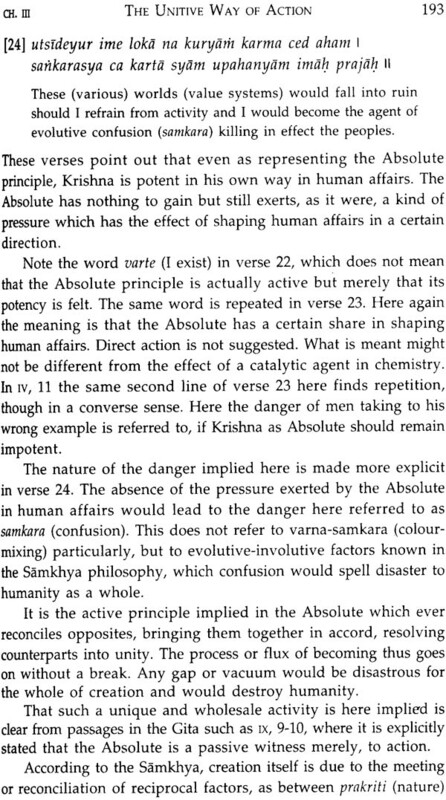 We shall not therefore linger long here in our futile effort to fix with precision the authorship not the Vyasa, wrote it. 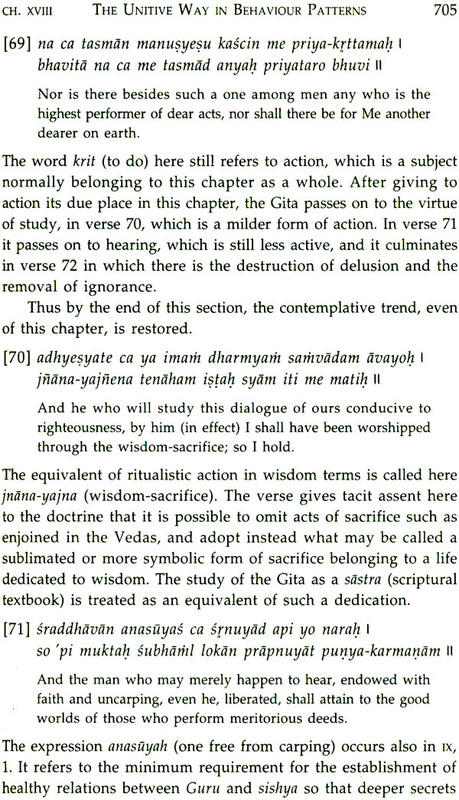 Scholars have suggested that the Gita is the result of the readjustment of Samkhya thought to the Vedic tradition, and that this took place about the third century BCE. 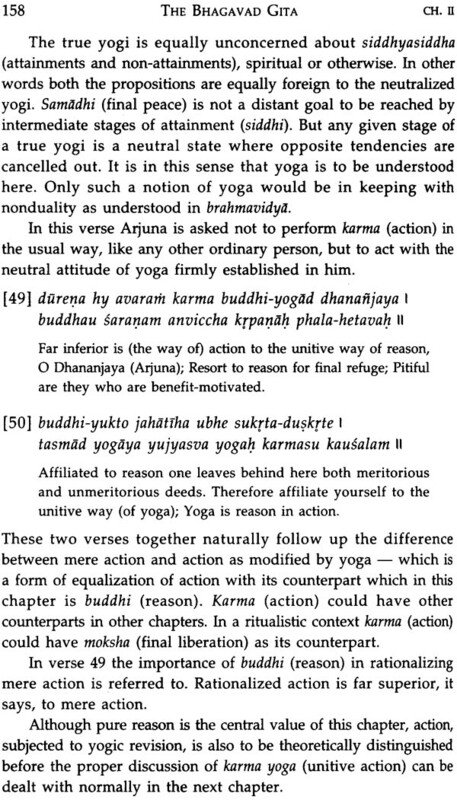 It is also further suggested that although the original was composed then, it was brought to its present form by some follower of the Vedanta in the second century CE. The famous Orientalist R. Garbe is responsible for these suggestions, to which J.N. 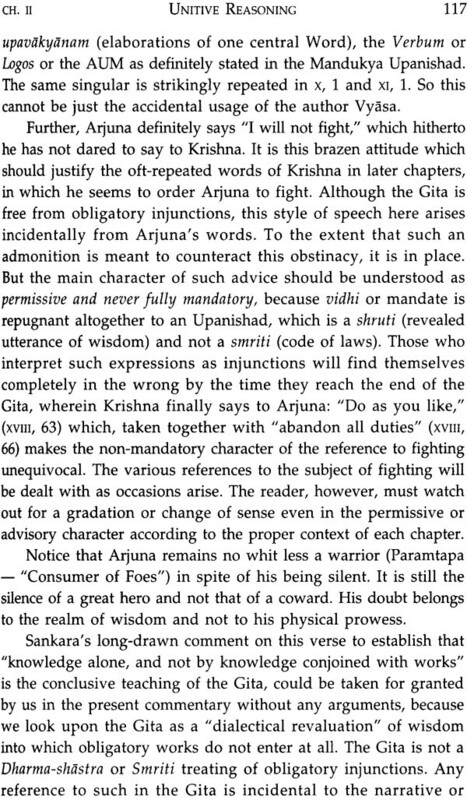 Farquhar adds the suggestion that Gita could be considered "an old verse Upanishad written later than the Svetasvatara and worked up into the Gita in the interest of Krishnaism by a poet after the Christian era." 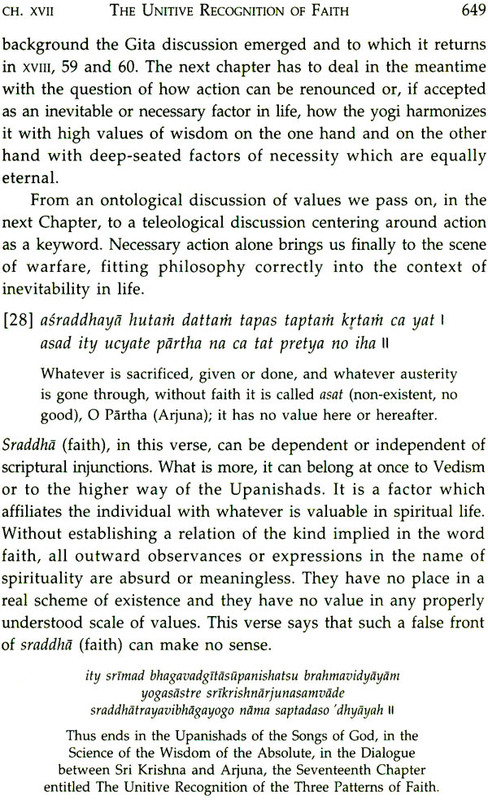 These speculations by Western like B. G. Tilak who, in their orthodox religious devotion to the book, tend to exaggerate the antiquity of the work beyond all limits that same and critical scholarship can appreciate. Tilak for example, puts the date as 3100 BCE. 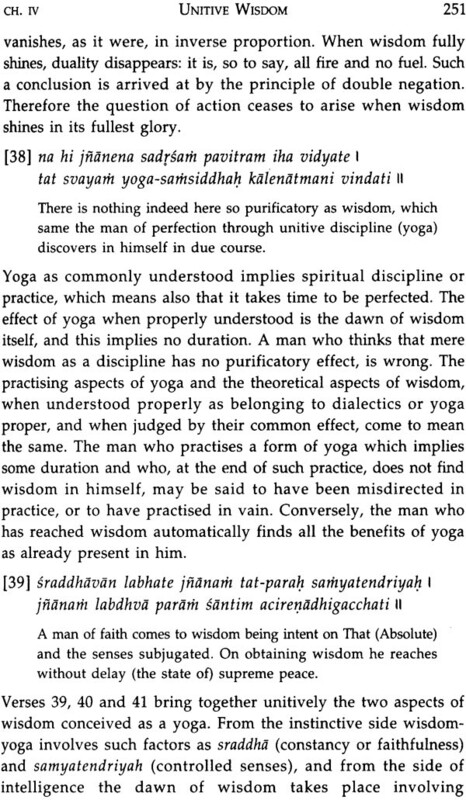 In the present work we do not wish to fix finally either the date or the authorship of the Gita. We believe that it would not be far wrong even to suggest that the Indian mind loves to retain the mystery rather than to lay it too bare. There is even a vernacular proverb which says it is wrong to trace the ancestry to a sage or to follow up a river to its very source. 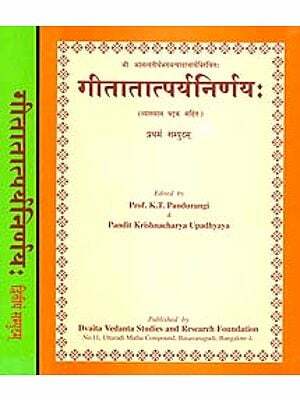 Seeing that many reputed scholars have applied their critical acumen and erudite imagination to this subject in vain, and out of deference also to the delicate sentiments of the popular Indian mind, we prefer, in this matter, to leave their say in this highly speculative domain, while we retain for ourselves an open mind.